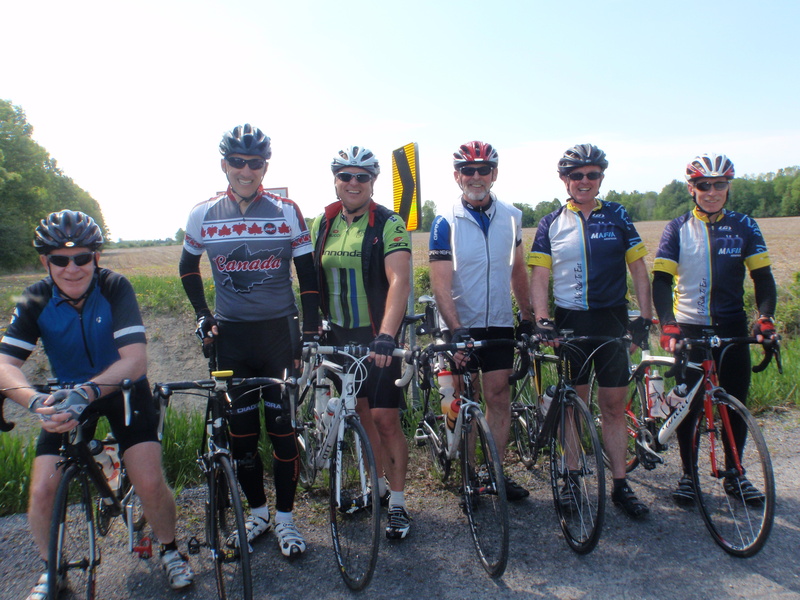 May 24/15: 89 Kms; 3 Hrs 1 Min; 491 Metres; Seven Riders. What is there about that stretch of road on Wolf Grove Rd from Union Hall to Almonte that irresistible to cyclists? Is it the buttery smooth pavement, the mostly downhill but rolling terrain, the urgent call of a tail wind that demands a response; or is it the anticipation of coffee soon to be enjoyed at The Palms; All of these, yes, but this morning they were merely the tinder waiting for someone, Mark in this instance, to ignite the fuse: it was fiery, it was grand, and it was glorious. You just should have been there. Yes, it was a fine morning’s ride and a good test of the legs. The wind was no friend. It took us all sharing the work in a cooperative exercise of equipoise to mount a reply to mother nature. Thanks to everyone for their contribution to the effort. Bonhomie on a bicycle is one of life’s little pleasures. I hope you join us soon. Okay, there you have it. Now for next weekend – well, my first thoughts are for a lumpy ride on Saturday (about 100 kms) and for a coffee, cake and culture ride on Sunday of 75 kms. Stay tuned.